Dry Chicken Chilli recipe by * at DesiRecipes.com. 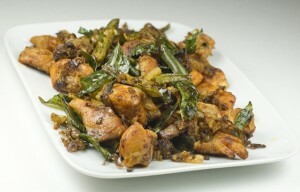 Hot Chicken dish in which tangy Chicken is marinated with vinegar and soy sauce and then saute with chillies. 4-5 (boneless and cut into small pieces). 6-8 green Chillies(seed and slice). 1 clove of Garlic (crushed). 1 tablespoon of Soya sauce. 1 tablespoon of Vinegar . 1 teaspoon of black Pepper (ground). Put the meat in a bowl and Pound it carefully to flatten slightly. Add soya sauce and vinegar , mix well. Leave for 20 minutes. Add crushed garlic , chicken , black pepper and salt . Fry until it changes colour . Add Ajinomoto top the fired chicken . In a separated frying pan, heat 1 tablespoon oil and stir fry the sliced chillies in it. Add vinegar , Soya sauce and Ajinomoto. Saute until tender but still crisp. Pour on the chicken and mix well. Serve hot. worth trying it, its delicious. its very easy to make like it's instant cooking :) simple .